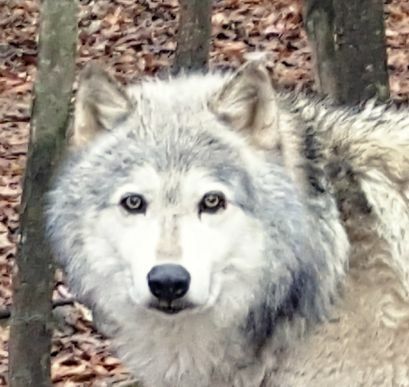 The Wolves are enjoying some very cold weather here at Wolf Howl Animal Preserve. Their coats are lovely and keep them warm. We bought extra wheat straw this year for bedding and it covers the floor of their den and is freshly strewn after rains in areas of their enclosure that they rest in. They are always excited when we bring it in. They like to help us pull it apart. 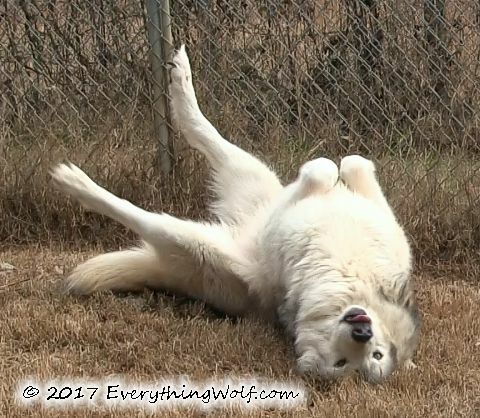 Having many years of experience working with Wolves, I’ve never believed they would be very happy in a typical Zoo setting. Their inherent fear of humans prevents them from doing so. Socializing them at birth does make a difference but certainly doesn’t make them into “dogs”. Pat Goodman of Wolf Pack told me many years ago when I was questioning her about the retired Wolves there, “Wolves have a short friends list.” I now understand what she means. Our Wolves have met their quota. I’m so happy we made the decision to stop giving tours. The Wolves are really responding by being more relaxed and less depressed after the death of their Alpha, Chito. It was time for them to retire from their duties as ambassador Wolves. They are enjoying the status of senior citizen Wolves. The Wolves had a special Christmas treat from one of Ohoyo’s Adoptive Mamas. Linda sent them all bags of wholesome USA made treats and we distributed them out throughout the month. We put some videos of them receiving them on our facebook page. We had their Christmas present party on the 25th. I was very happy that the seemed to really enjoy it except for Wa-ta-chee. He just doesn't like parties and never has. He waits until all the excitement has died down and then he goes and gets himself a few treats or a toy to tear up. The Wolves received beef knuckle bones, pig ears, Christmas piggy toys and squeaky snowmen. Thank you to all their adoptive parents who make these parties possible for them. Below is the video from this year's celebration.